The moral of this post is never underestimate a small medieval church in a small pre-Doomsday village. My husband is adding to the genealogy of his family line and, in search of the later more law-abiding contingent, he is keen to visit churches in the locality during open days when parish records, often dating back to the 1700s or earlier, are available to view. Just such took us to the village of Aldbrough, population currently about 1,000, in the East Riding of Yorkshire, and into the 14th century church of St Bartholomew. The church stands on a circular mound, thus immediately giving an inkling, not only of an earlier building or succession of buildings, but of a pre-Christian meeting place. I knew there was what some believe to be a Viking-age sundial, but I wasn't prepared to meet Sir John de Melsa, the "Giant of Bewick", who fought alongside Edward, the Black Prince, at the Battle of Crécy (Cressey) in 1346, part of the Hundred Years' War with France. His effigy, in full armour including chain mail, measures six and a half feet in length. He would probably have been clutching a, if not his, sword down the length of his body. Alas, over the centuries he has also lost his feet, resting on the lion. Note the righthand pic which shows what is hanging above his chest tomb. This is a copy of the bascinet upon which Sir John's effigy rests its head, except it's not quite. 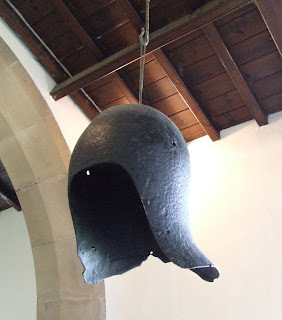 It is the copy of what was left of the original bascinet which hung above his tomb until in 1989 leave was granted by the Diocese of York for it to be sold to the Royal Armouries. It now resides in the Tower of London. Evidently these complete, or almost complete, effigies with a knight's accoutrements are extremely rare - as in there might only be one other in the country with a helm dating from the period. It is surprising that it survived at all. The north aisle in which this monument stands, originally Saint Mary's Chapel, was used as a school in the early 19th century. According to the church's information leaflet the helm - the original helm - was used as a coal scuttle, doubtless by the same miscreants who carved their names in the lion, though they were hardly the first if that 1673, bottom right, is to be taken at face value. Methinks I need to delve into the life and times of Sir John de Melsa, Governor of York 1292-96, and the Lords of Bewick. For a start, Melsa is Meaux situated between Aldbrough and Beverley, where a Cistercian abbey had been founded in 1151. So why did he direct that he should be buried in the small village church of Aldbrough? Is there ever enough hours in the day? The same goes for the Viking-age "sundial" now incorporated into the wall of the south aisle, the image of which Blogger refuses to upload. I shall take that as a sign and give it a post of its own in the future. Note: All images are copyright: (c) Linda Acaster 2018. Clicking on each will (should) provide a larger view. Wow! I can hear your brain whirling around from here. Glad you enjoyed the post, Sharon. It was certainly a fascinating couple of hours, which doubtless will lead to days of research - when I can fit it in! Grafiti is no modern phenomenon, of course. Some years ago, Valerie and I climbed the monolith in Rhodes that gives Monolithos its name. Around 600 feet high, and with sheer walls on 3 sides, the tall stone block is accessed by a winding track that climbs steeply up the 4th side. Atop the rock sit 2 Greek churches in the typical half cylindrical shape. The modern one, although this rock is miles from anywhere, bore lighted candles (who lit them?). And the ancient church, now a ruin, carried grafiti from the early 1800s, much of it in Latin! It, too, was carved into the stone. True, Stuart, about graffiti, but it still made me cringe to see it. And using the knight's actual helmet as a coal scuttle..!! It is, of course, as is your experience, all great fuel for writers of fiction. I must've been so busy with the WIP, I neglected to consider this as story material: now, what might I do to include this in...? So close to home, and you only just found it. Always the same. (btw, Linda, you have 'Cisterian abbey' for Cistercian). And when are you going to tell us about Dave's less law-abiding ancestors? Soon, I hope. What's worse, we used to live in the village in days of yore (hangs head in shame!). "Cisterian" duly changed. Slip of the fingers and blind as a bat, obviously.